Add some Halloween fun to your ELA classroom! 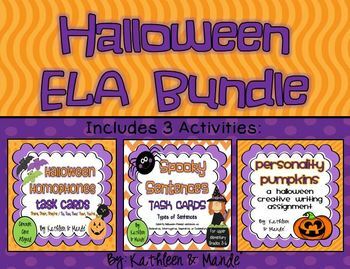 We have bundled all of our ELA Halloween activities into one value package....an $8.00 value for just $6.40! 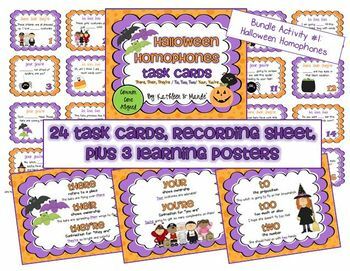 - 24 task cards (3 of each most commonly misused homophone: there, their, they’re, your, you’re, to, too, & two) – Students will read a given sentence and determine which homophone best completes the sentence. 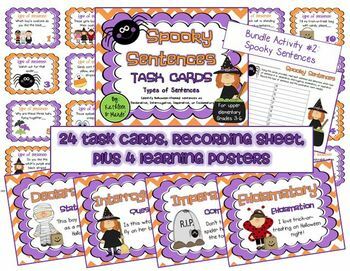 - 24 task cards (6 of each type of sentence: Declarative, Interrogative, Imperative, Exclamatory) – Students will read a given sentence and determine which type of sentence it is as well as which punctuation mark is needed. 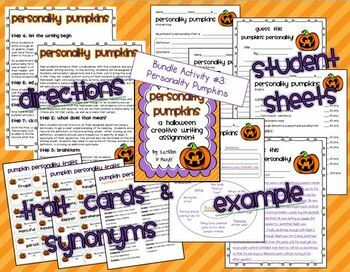 Assign students a pumpkin personality trait (adjective). Students must look up the definition and synonyms. They will then bring their pumpkin to life and write a story about their pumpkin's adventures on Halloween night. They will focus on integrating thoughts, actions, and words that reflect their pumpkin's personality. Enjoy these wonderful ELA Halloween activities!